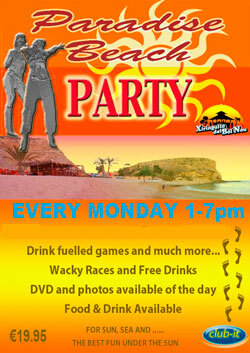 The highlight of everyone's holiday must be the Paradise Beach Party each and every Monday. We take you on a short journey by bus to a beautiful secluded beach surrounded by cliffs. This is a day out jam packed with fun. We have loads of games and wacky races. Have you ever tried space hopper races in the sand and water races on kiddies inflatable's. There is tug of war pitting the nations against each other, volley ball and so much more. We have plenty of stuff going on with whipped cream and ice cubes that for now we will just leave to your imagination. There are plenty of bottles of champagne to be won and if you get thirsty from all the excitement there is a bar right on the beach to quench your thirst. Its a great day out for only €19.95 (£15) and fun for everyone.